This isn’t my usual Wordless Wednesday; I need to mark the occasion with more than just a picture. This is my oldest son, Brandon. He graduated from high school last night. He’s always climbed as high as he could; he received a plastic Tyco tricylcle for his first birthday, one with 2 wheels in front & one in the back. One night when I was making dinner, I left B alone with his bike in the living room for a few minutes and when I returned, found him standing balanced on the handlebars, a feat he would repeat until he grew out of the bike much to the shock and dismay of his grandparents; I had tried to stop him, but he was persistant and insistant and never fell off. When he was 3, Brandon went out to the car ahead of us by a few minutes and was climbing unsupervised on the back of our Jeep Grand Cherokee with the hatch closed. He slipped, fell on his elbow, and broke his ulna almost in the elbow joint. Side note: the ortho we saw had the biggest hands I’ve ever seen, and not just because of the contrast between small boy and man hands: this doc needed extra large latex gloves. We explained to him how risky that was and chided him for not waiting for the rest of us. The cast on his arm slowed him down temporarily, but ultimately didn’t make him any more cautious or less confident in his abilities. When he was 7 or 8, much to the horror of my neighbor, he climbed on top of the playsets in our backyard, not just on top of the swings, but up onto the roof of the treehouse that the slide is attached to and would jump off, down to the ground, after declaring himself king of the mountain. None of the other kids could follow him and believe me, they tried. Because of his climbing abilities, my husband started taking him and my 2nd son Ethan rock climbing at an indoor climbing gym near his work, really the only one in our area. B was a raging success, climbing up their 50 foot wall in record time, ringing the bell at the top, and belaying back down. Ethan, on the other hand, could only go up about 20 feet before he froze in fear. They joined the kids climbing team and my husband began climbing also, joining the adult teeam. They all ended up focusing on bouldering and we’d occasionally all go climbing, except for my youngest, Henry, who was too small at the time; he ended up just playing on the climbing mats & running around. Brandon got so good, he became the captain of the kids climbing team. I have video of him climbing one of the bouldering walls 3 years ago with just his arms. So really, this picture of him on the field goal last night has been a long time coming. He had to do it twice, even – we had camera problems the first time around. 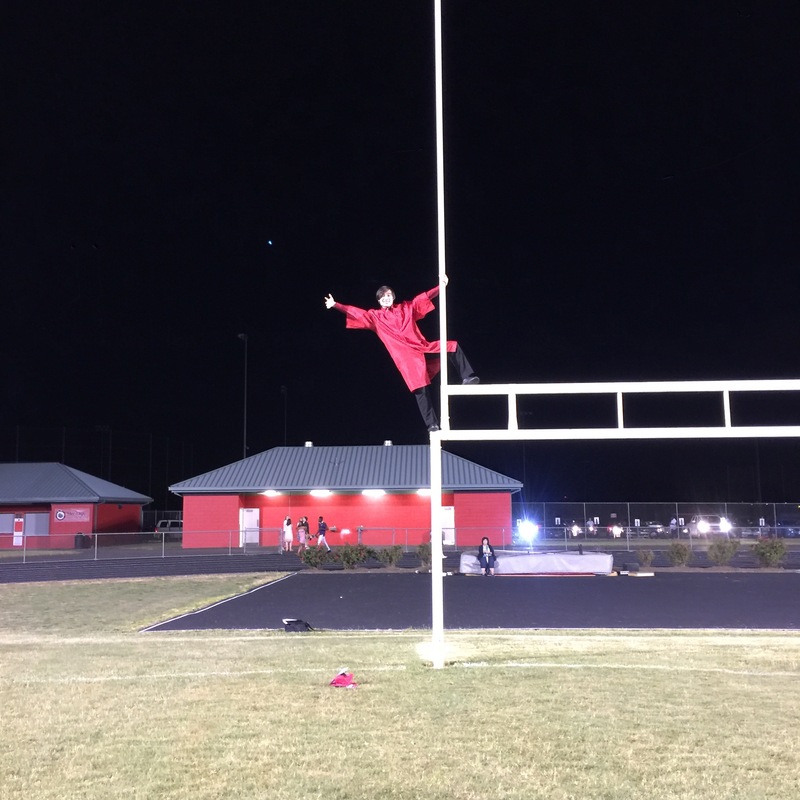 As he was jumping down a second time, another set of parents walked by and the wife said sort of quietly to the husband, “That’s a good way to get suspended!” I guess she didn’t register the cap, gown, and diploma. We wouldn’t have been able to stop him anyway and I stopped trying way back when he’d climb up on the handlebars of that bike. Some things are just a fundamental part of your kid and you’ve got to just go with it because fighting against it would be futile & soul crushing. I look forward to seeing him figure this out too, not necessarily with climbing, but with other parts of his personality/being; I look forward to seeing what he metaphorically climbs next. Congrats to you and to him! What a wonderful photo! Side note, I am betting you were another parent who knew exactly what your child could do, and had many parents upset that you’d allow him to do those things while their children could not. I have often been chided for allowing my child to “set a bad example” despite the fact that my child was perfectly capable of doing what she was attempting to do and there was nothing at all wrong with that action. Daring children are awesome! Wow – I’ve actually never thought of it like that! Thank you! Lovely post. Brilliant photo. The saying ‘boys will be boys’ is there for a reason. They HAVE to do the dangerous and/or exploratory stuff, right? Well, this particular boy sure did, the other two have been a little less daring physically.